Horizon Zero Dawn, the well-received western RPG by Guerilla Games, came with a sprawling score with contributions from Joris de Man, The Flight, Niels van der Leest, and Jonathan Williams. It’s difficult to talk about the soundtrack as a whole, as it’s divided into four very different sections: Motherland, Out of the Embrace, Onwards to Meridian, and Secrets of the Earth. Each composer contributes a different amount in each section, and each section is stylistically different, with a few connecting themes and instruments. The first section is Motherland, which contains one of the best character themes I’ve heard in a while, and is generally packed with rich, orchestral/acoustic content. It’s also the section that most prominently features Julie Elven – the up-and-coming vocalist you might have heard from World of Warcraft: Legion. “Prologue” opens the score with an interesting approach. 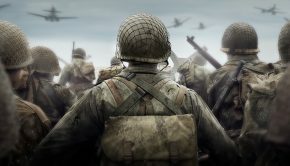 It’s not especially melodic – this is not the main theme to anything, although a few themes from the game do subtly work their way into the track – and it’s neither bombastic nor ambient. Although it’s not the main theme of the game, it is indicative of the direction of the score with its prominent instrumentation, light use of melody, and intricate parts. The second track, “Aloy’s Theme” is fantastic – and the real thematic opening to the soundtrack. The melody is beautiful and memorable, and it develops very well across the piece. Parts of the development are even complex enough to make their way into other tracks in the score. The track itself is emotional, with the melody first being played on a cello and then with Elven’s vocals. Many of the following tracks after these two openers follow some combination of thematic content and background content. As with the first track, although the main themes take a backseat in much of the music, they’re rarely entirely absent from the track. When they are, other melodic content takes over, or notable harmonic progressions. “The Point of the Spear” opens with a series of arpeggios that outline a striking progression. Although Aloy’s theme shows up in the track, the progression continues underneath it, and later returns in the score as an unusual motif. Other tracks here use equally varied techniques to keep the pace up – in a massive score like this one, it’s easy to let sections of music fall by the wayside. However, de Man refuses to let any “filler” tracks slip in. 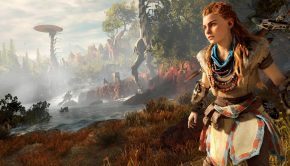 “Vanished Voices” starts off with a series of unsettling sounds, but in less than thirty seconds, the flute from “Aloy’s Theme” has shown up, and a catchy little string rhythm takes us into a more instrumental section. “Seal Your Lips” opens with a hope-filled string part and moves into a darker section where familiar melodies return with more sinister tones. Motherland is also a good section of the soundtrack to visit for acoustic action tracks, as it offers quite a few. 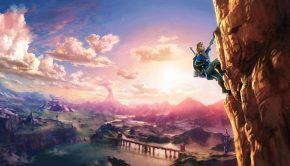 You won’t find the usual dramatic open-world battle music, but the pace and level of percussion picks up in tracks like “Years of Training” and “The Proving”. “The Cavalry Breaks Through” is not quite as fast-paced, but certainly matches – and surpasses – the intensity level. On the other hand, “To The Hunt!”, composed by Niels van der Leest, consists of nearly exclusively percussion with some lines being performed at breakneck speed. The tracks towards the end of the first section become more varied, following cutscenes and storyline content rather than area music. There’s “The Bad News” and “The Good News”, appropriately ominous and encouraging, with touches of synthetic sounds in each track. (Although electronic material is rare up to this point, it does have a prominent place in later sections of the soundtrack.) “The Good News” in particular is a fun track with a delightful string-and-synth combo towards the end. The second section is called Out of the Embrace, and is, for me, the highlight of the album. The section contains a collection of area music – the heart of any open-world game – with a beautiful array of motifs judiciously used at deliberate points. This section could easily be boring. There are lots of stretches of sound without much movement. Some of the pieces don’t have much thematic content until the end. However, de Man keeps me coming back for more – chords finally change just as I’m about to skip to the next track, an intriguing motif shows up just as the harmonies are getting old, and flurries of instrumentation happen when a stretch of mechanical ambiance is about to run dry. As someone who looks for traditional melodic and harmonic content – to a fault – when it comes to orchestral scores, this section should have driven me crazy. Instead, I love it. Perhaps the best example of this is in “Machine Dreams,” a track towards the end of Out of the Embrace. The entire track consists of a soupy mixture of synth and acoustic lines, so blended together that it’s hard to tell which is which. Little percussive undulations keep the piece from being totally devoid of movement, and the occasional pipe shows up here and there. On its own, I would skip the piece without a second thought, not taking the time to decide I dislike it. However, a haunting chord progression strikes up towards the end – not only do I love it, but I find it sticks in my head for long after I’ve heard several other tracks on the score. Much of Out of the Embrace relies on this chord progression – the one, in fact, first heard in “The Point of the Spear.” It’s hard to pinpoint, and I’m not entirely sure how widespread it is; however, part of why Out of the Embrace is my favorite section of the soundtrack is this progression. If “Aloy’s Theme” is the basis for the Motherland, then this anonymous theme is the basis for Out of the Embrace. It also shows up in “Her Breath, Her Land,” which makes use of wooden pitched percussion to take some material from “Aloy’s Theme” and place it in a more relaxed setting, and “In Great Strides” which uses solo instruments to convey the theme. “Within The Embrace” opens this section with flurries of light percussion that give the piece a thoughtfully upbeat quality. After a few Aloy’s theme harmonies, the piece ends with the same harmonic theme with a beautiful set of strings. The section seems to alternate between gentle orchestral sections and the more metallic, synthy moments from earlier. The Flight, the music duo consisting of Joe Henson and Alexis Smith, takes over a bit of the music in this section from de Man; tracks like “Cloudpart” and “Territory of None” showcase their ability to write solid electronic tracks that effectively take a backseat to the action of the game without compromising music quality. They clearly work with de Man on the score, as they incorporate melodies and motifs that show up on his tracks. “Brave, New” very quietly incorporates the harmonic sequence, mirroring the pattern from “In Great Strides” but with more anonymous electronic instrumentation. The Flight also closes the second section with “The Memory of Old Walls,” a more atmospheric track with a meandering cello and pulsing bass. The Flight’s contributions to the album tend to be even gentler than de Man’s, which is saying a lot. Once again, the impressiveness of Horizon Zero Dawn’s score isn’t in its action-packed melodies or grand-scale cinematic orchestra, but in its quiet, unassuming approach. Despite the massive scale of the soundtrack – we still have another two sections to address – I am able to listen to it straight through without feeling overwhelmed. For those looking for more activity, the third section of the score will deliver. Onwards to Meridian opens with “Aloy’s Journey,” a dynamic track that brings Julie Elven back into the score. Because the instrumentation can be sparse in other areas of the soundtrack, the fact that the first track of Onwards to Meridian contains vocals, percussion, pipes, and strings among its range of instruments gives it extra power in the score. This is especially true after Out of the Embrace, a generally calmer part of the score with less activity. Onwards to Meridian brings a few new styles to the mix. Many of the tracks – both The Flight’s de Man’s included – incorporate delightful mixes of sounds from both the electronic and acoustic realms. “Meridian, Shining” uses themes from earlier, but this time with a backdrop of pitched percussion and distortion for a sparkling effect. “All The Light Reaches” uses some kind of distortion for its solo instrument in an almost hypnotizing track and “A Resplendent Soil” has a warm ambiance to it broken by bright little rhythms and broken chords. On the other hand, “Across the Daybreak” features a cello for a climactic, dramatic melody. Several of the tracks in this section use raw instrumentation to suggest a distinct culture. “City on the Mesa” is a lively, percussive track with a variety of stringed instruments – both plucked and bowed – and a simple (yet distinct) melody. Similar instrumentation returns for “Envoys”, but in a sparser setting. “Delver’s Hymnal” starts slowly, but ends with a songlike melody, not unlike “City on the Mesa”. The simplicity of these melodies make them easy to hum, which adds to the folksy vibe in Onwards to Meridian. I constantly feel as though there is an entire culture behind these tracks, which make them all the more successful. Additionally, several of the tracks in this section have titles that indicate a direct connection to the game’s city of Meridian – primarily the contributions of composer Jonathan Williams. “Your Hand of Sun and Jewels (Carja Traditional)” is a steady song that sounds as though it is meant to accompany a campfire, hand-clapping included. “Kunabass Solo”, “Iron Pendulum Solo,” and “Braumdrum Solo” all feature clips under one minute of instruments being played to emulate the sounds of Horizon Zero Dawn. “Go Like Time Around an Arrow (feat. Circle Percussion)” brings back Niels van der Leest for another percussive spread, this time with some harmonies included. The fourth section, Secrets of the Earth, is the darkest and most intense part of the soundtrack with heavier electronics and more dissonance than the rest of the score. “The Spreading Eclipse” immediately sets a new tone with raw electronics, a chromatic melody, and atonal distortions that sound even more jarring after the softer sounds of before. “Force Multiplication” uses a combination of acoustic instrumentation from earlier in the score and buzzing percussion to indicate the shift in tone. I found this section to be the least interesting to listen to from an aesthetic standpoint, independently of the game. As someone who’s played through the game, I can see that they fit the events well, and serve as an effective complement to the gentler tracks from earlier. However, this is not my section of choice. The tracks tend to range from ominously heavy (“Buried Shadow”, “The Battle Begins”, “Threat Assessment”) to growling electronics (“Countdown to Zero”, “Hold the Ridge”). This is the section that momentarily makes me wonder if dividing up the sections was the right decision, as it’s the most difficult one to listen to straight through. I have to commend Joris de Man, The Flight, Niels van der Leest, and Jonathan Williams for Horizon Zero Dawn Original Soundtrack. Despite the length of the album, this is not a Halo score that suggests an impending apocalypse with every orchestral track; nor is it Skyrim, where a few themes pepper a grandiose, atmospheric choral symphony. Instead, think more along the lines of The Witcher 3 – but lighter, with a few more woodwinds. In an era of games where the goal seems to be to make everything as big and bombastic as possible (especially in the world of Western RPGs), de Man et al. 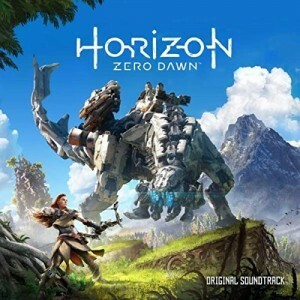 approached the score with a few memorable themes and (generally) light instrumentation, and transformed them into an 80-track album that feels not only colorful and varied, but connected; regardless of the section I’m listening to, I know I’m listening to Horizon Zero Dawn. I do wonder if a “highlights” album might be effective – I have to assume there is a target audience of Horizon fans interested in a sampling of the album rather than four hours of music. That being said, I enjoy listening to this score straight through, and I find myself frequently returning to it. Posted on June 10, 2017 by Emily McMillan. Last modified on June 10, 2017.